Difference between revisions of "Overdell Cemetery"
The '''Overdell''' wasteland serves as the entrance to Dark Lord Mansion, where one of the 7 Card Leaders, [[Vamdemon]], resides. Skull Greymon stands guard at the entrance of the cemetery, while Bakemon can be found intercepting all who attempts to visit Vamdemon in the '''Cemetery''' itself. The only way in to the mansion is with a key, but since Bakemon recently lost it, all travelers wishing to visit Vamdemon is turned away. Bakemon states that it may have lost the key on its recent trip to [[Dragon Eye Lake|Dragon's Lake]] in the [[Unwavering Forest]]. Only by obtaining the key can one hope to gain an audience with Vamdemon. Debut "The Dancing Ghosts! Bakemon"
Overdell Cemetery (オーバーデル墓地 Ōbāderu Bochi) is a graveyard located within the wasteland Overdell (オーバーデル Ōbāderu) northwest of Tropical Jungle in File Island. The Overdell Cemetery is infested with ghost and dark Digimon, and also serves as the front yard of Dark Lord Mansion. First appeared in "The Dancing Ghosts! Bakemon", Overdell Cemetery is disguised as a foggy forest with a church where people reside. Jou and Sora arrives at the cemetery after Devimon splits up File Island, where they are fooled by the Bakemon disguised as people into becoming the offering of the "Great Bakemon," which is a huge Bakemon combined from all of the Bakemon in the cemetery. Jou manages to defeat the Great Bakemon by chanting a sutra, weakening the Bakemon and allowing for Ikkakumon and Birdramon's attacks to work. Overdell Cemetery is located within the Overdell wasteland, and is the only entrance to Dark Lord Mansion. Within it is a Bakemon which is verbally challanged. It asks questions using its name (eg: "Bake bak bake bake?") to anyone who would interact with it. If all of these yes/no questions are answered correctly, Bakemon may be convinced to join the city. 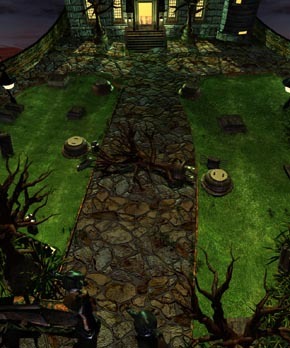 The Overdell wasteland serves as the entrance to Dark Lord Mansion, where one of the 7 Card Leaders, Vamdemon, resides. Skull Greymon stands guard at the entrance of the cemetery, while Bakemon can be found intercepting all who attempts to visit Vamdemon in the Cemetery itself. The only way in to the mansion is with a key, but since Bakemon recently lost it, all travelers wishing to visit Vamdemon is turned away. Bakemon states that it may have lost the key on its recent trip to Dragon's Lake in the Unwavering Forest. Only by obtaining the key can one hope to gain an audience with Vamdemon.